For whom God daily feeds. Glows this vale of ours. were inflamed, so as willingly to endure so great a passion for us sinner. Francis' treasure here on earth was Jesus in the Sacrament of the Altar. "He communicated often and so devoutly that others too began to honour Christ devoutly in his Eucharistic form." Not long before he died he wrote to his brothers beseeching them "to pay all devotion and honour to the most holy Body and Blood of our Lord Jesus Christ." O Love by You I'm rapt in ecstasy! O Living Love! Cast me not from Your sight! O Love, O Love, my soul is one with You! In such a loving strife. Daily the Son of God demeans himself, as he did long ago when he left his kingly throne to enter the Virgin's womb. Daily he comes to us in person. Daily he descends from the Father's bosom on the altar. And as he showed himself in human form to the Apostles, so now he shows himself to us in the sacred Host. And as the former only saw his flesh and yet believed that he was God, so we too, who see the bread and wine, must firmly believe that this is his true and living Body and Blood. is present on the altar. should make himself so small! under the homely form of bread. and give me sound faith, firm hope and perfect love. so that I may truly carry out You holy and true command. Lord, show me Poverty whom you loved so dearly. I can find no peace without her. Grant me the privilege of possessing her. I yearn to be enriched by this treasure. I implore you, it may belong to me and mine forever. But only to live on what others may give me. Francis viewed creation as a sacrament as God was in all. Thus Francis' brotherhood included more than his fellow companions living in poverty it embraced all of God's creation the sun, moon and stars, the wind and air, the water and fire, flowers and herbs, fruits and vegetables. The sparrow was as much his brother as the pope. This is evident in the sermon he preached to hundreds of birds about being thankful to God for their wonderful clothes, for their independence, and for God's care. My little sisters the birds, ye owe much to God, your Creator, and ye ought to sing his praise at all times and in all places, because he has given you liberty to fly about into all places; and though ye neither spin nor sew, he has given you a twofold and a threefold clothing for yourselves and for your offspring. Two of all your species he sent into the Ark with Noah that you might not be lost to the world; besides which, he feeds you, though ye neither sow nor reap. He has given you fountains and rivers to quench your thirst, mountains and valleys in which to take refuge, and trees in which to build your nests; so that your Creator loves you much, having thus favoured you with such bounties. Beware, my little sisters, of the sin of ingratitude, and study always to give praise to God. As he said these words, all the birds began to open their beaks, to stretch their necks, to spread their wings and reverently to bow their heads to the ground, endeavouring by their motions and by their songs to manifest their joy to St Francis. And the saint rejoiced with them. Another famous story involves a wolf that had been eating human beings. Francis intervened when the town wanted to kill the wolf and talked the wolf into never killing again. Afterwards the wolf became a pet of the townspeople who made sure that he always had plenty to eat. Having listened to these words, the wolf bowed his head, and, by the movements of his body, his tail, and his eyes, made signs that he agreed to what St Francis said. The last years of Francis' life were ones of illness and blindness. It was in this state that Francis composed his now most famous hymn of praise the Canticle of all Creation to which he added as death approached the verse welcoming Sister Death. It is said that this hymn was constantly on his lips throughout his illness. Praise be You my Lord with all Your creatures, especially Brother Sun, Who is the day through whom You give us light. And he is beautiful and radiant with great splendour, and bears a likeness of You Most High. Praise be You, my Lord, through Sister Moon and the stars, in the heavens you have made them bright, precious and fair. Praise be You, my Lord, through Brothers Wind and Air, And fair and stormy, all weather's moods, by which You cherish all that You have made. Praise be You Lord through Sister Water, So useful, humble, precious and pure. Praise be You Lord through our Sister, Mother Earth who sustains and governs us, producing varied fruits with coloured flowers and herbs. Praise be You my Lord through those who grant pardon for love of You and bear sickness and trial. Blessed are those who endure in peace, By You Most High, they will be crowned. Praise be You, my Lord, through Sister Death, from whom no-one living can escape. Woe to those who die in mortal sin! Blessed are they She finds doing your most holy will! No second death can do harm to them. Praise and bless my Lord and give Him thanks, And serve Him with great humility. Francis had a great devotion to Pater Noster, and always recited it with great care, so much so that he made a meditation upon it, for his own use. Hail, holy Lady, most holy Queen, Mary Mother of God, ever Virgin. with His most Holy Beloved Son and the Holy Spirit, the Comforter. You are the daughter and handmaid of the most high King and Father of heaven. and all the saints, to your most holy and beloved Son, our Lord and Master. To conclude our devotions there is a short litany with the Response: St. Francis of Assisi pray for us. By your example may we learn that life does not consist in the pursuit of wealth nor in the abundance of our possessions. Response: St. Francis of Assisi pray for us. By your holy death, help us to live each day as our last and to welcome sister Death. let us in light see Light. The transfiguration of Jesus, described in the Synoptic Gospels (Matthew 17.1-9, Mark 9.2-10 and Luke 9.28-36, is of the most mysterious of the events recounted in the life of Jesus. Taking Peter, James and John, Jesus goes up a high mountain, which tradition identifies as Mount Tabor in Galilee. There he is transfigured, his face shines like the sun, and his clothes become white as light. Moses and Elijah appear, talking with him. They demonstrate the witness of Law and the Prophets of Israel to Jesus as Messiah. The voice from heaven, which has already proclaimed Jesus' divine Sonship at his baptism, does so again here. This episode ends with Jesus' command to the three disciples, to tell no one about the vision until the Son of Man is raised from the dead. Shine brighter than the sun. By it let it praise his humility. glory as of the Father's only Son. one in Being, for ever. This feast began very early in the Orthodox Church, and was not adopted into the Western Church until the 15thC. In Orthodox iconography there on a mountain peak Jesus is shown within a mandorla, an almond-shaped panel symbolizing the glory of divinity. His clothing gleams, and from him come rays of light, often painted in the gold which is another symbol of divinity. They fall on the three disciples, who are prostrate on the ground below him, and Moses and Elijah on either side of our Lord. Mount Tabor was overspread with light. at the form which cannot be seen. when they saw on earth the Lord of glory.
. That light which streams from Jesus in the icon illumines also the whole mountainside, representing the created order. In Orthodox thought the whole of the material creation is destined to be transformed in the kingdom of God. Orthodoxy does not separate the material and the spiritual. The material creation is meant to become the home of the Spirit and to find its fulfilment within the life of the Trinity. The transfiguration of Jesus concerns therefore not only him personally, but ourselves and all creation. It is a sign of all mankind's eventual transfiguration, within a transformed universe. When we contemplate the icon of this feast, we contemplate our own ultimate destiny. of your own divine nature. The transfiguration of Jesus occurred soon after his prediction of his suffering, and death. The disciples were naturally dismayed. But the light that shone from Jesus on Mount Tabor did not last, because Jesus could enter into the glory of the Father only by way of the cross. For Luke the presence of Moses and Elijah on Mt. Tabor symbolised Christ's exodus his journey through death to life by His resurrection. This would be accomplished by His going to Jerusalem. In John's Gospel the crucifixion of Jesus is at the same time his glorification; and after his death the light of his glory will shine permanently as the light of the resurrection. After the resurrection Christ's Exodus continues as He leads forth the new people of God in the freedom of the new Covenant, now associated with the Sacraments of Baptism and Eucharist and not with the Law. At the time the disciples could not grasp this Passover imagery, but the writings of' the apostolic age manifested that this passing over from death, to life and glory came to be understood as belonging to the heart of the Christian Message. in himself exalting human nature. Furthermore Mt. Tabor is a foretaste of the final glory, when Christ comes to establish the kingdom of God in power. So the light of Tabor is an anticipation too of the parousia, the final coming of the Lord in glory. Meanwhile, the presence and work of the Holy Spirit in the Church and in the world spreads the new life of the resurrection, which will come to full fruition in God's kingdom. Of course that kingdom is present even before his death in the person of Jesus, on whom the Spirit rested at his baptism; and the light that shone from him on Tabor is the light of the Holy Spirit. That light first of all reveals the divinity of Jesus, in whom, says St Paul, 'the whole fullness of deity dwells bodily' (Colossians 2.9). But, as the Council of Chalcedon affirmed, Jesus is not only perfect in his divinity: he is also perfect in his humanity. So the transfigured Jesus is also the revelation of what a human being, created in the image and likeness of God, is meant to be. In the Orthodox understanding of humanity, the Fall has not deprived us of the image of God, but it has taken away our likeness to him. That likeness is restored in Jesus, the proper man, as Luther called him. Let Christ be transfigured, and so save all. 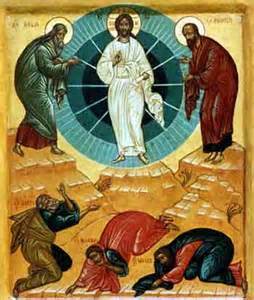 The transfiguration of Jesus, like his baptism, is a revelation of the Trinity. Jesus, God the Son, the Second Person of the Trinity, shines with the light of the Holy Spirit, the Third Person of the Trinity; while the voice of the Father, the First Person, proclaims Jesus' Sonship. It is the light of the Trinity, which dazzles the disciples' sight on the holy mountain, and causes them to fall to the ground in amazement. But it was not a glory, which the disciples at the time could fathom. No doubt they would have welcomed a glory on the mountain far away from the conflicts which had happened and the conflicts which were going to happen as Jesus sets his face towards Jerusalem. Yet it was these conflicts which Jesus took with Him to the mountain to be transfigured with Him. Thus It was the transfiguration of the whole Christ, from his first obedience in childhood right through to the final obedience of' Gethsemane and Calvary. the glory of your divine form. more radiant than the sun. quite unable to look up. It is indeed good to be here, as you have said, Peter. It is good to be with Jesus and to remain here for ever. What greater happiness or higher honour could we have than to be with God, to be made like him and to live in his light? Therefore, since each of us who possesses God in our heart is being transformed into the divine image, we also should cry out with joy: 'It is good for us to be here' -- here where all things shine with divine radiance, where there is joy and gladness and exultation; where there is nothing in our hearts but peace, serenity and stillness; where God is seen. For here, in our hearts, Christ takes up his abode together with the Father, saying as he enters: 'Today salvation has come to this house.' With Christ, our hearts receive all the wealth of his eternal blessings, and there where they are stored up for us in him, we see reflected as in a mirror both the first fruits and the whole of' the world to come. We are not allowed to linger there. We are bidden to journey on to Calvary and there learn of the darkness and the desolation which are the cost of glory. But from Calvary and Easter there comes the Christian hope of immense range: the hope of the transformation not only of mankind but of the cosmos too. O God, who on the holy mount revealed to chosen witnesses your well beloved Son, wonderfully transfigured, in raiment white and glistening: Show us too the splendour of your beloved Son. As we listen to the voice of your Son, help us to become heirs to eternal life with Him, who lives and reigns with you and the Holy Spirit, one God, for ever and ever. Amen.